Whether planted as a perennial border, added to an informal flowerbed or naturalized in a field or along a roadway, purple coneflower (Echinacea purpurea) provides lovely color as well as sturdy cut flowers throughout the summer season. 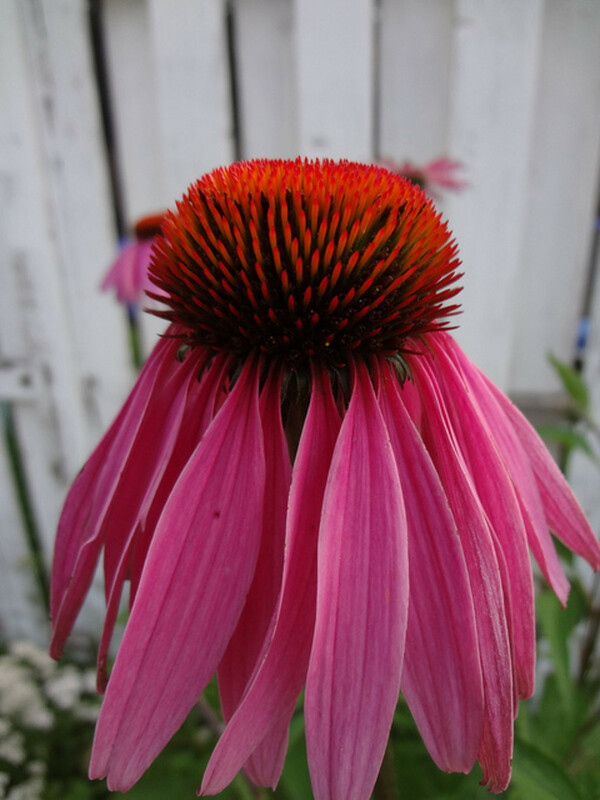 Purple coneflower is also a relatively low-maintenance plant that's easy to grow from seed. Perhaps that's why, of the 4 species of Echinacea commonly grown today, E. purpurea is by far the most popular. E. purpurea isn't an extremely picky plant; however, it grows best in Hardiness Zones 3 to 9 and prefers a full-sun location with rich, well-drained soil. If your garden soil isn't rich and loamy, join the club! And work organic matter into the ground before sowing or planting purple coneflower. As for full sun, that's not negotiable if you want a thriving, blooming E. purpurea plant. Six to 8 hours per day is definitely required. However, a little bit of shade when the weather's really hot will result in more intensely purple flowers. Inside its hardiness zone, E. purpurea is a herbaceous perennial. In other words, it dies to the ground in fall when the first frosts come and then sets new growth from its living roots in the spring. Of course, if you really love purple coneflower but live outside its preferred climate area, you could grow it as an annual from potted nursery plants. Echinacea is a member of the aster family (Asteraceae). There are 4 primary species of Echinacea in cultivation today: E. purpurea, E. angustifolia, E. pallida & E. paradoxa. E. purpurea is the most commonly grown species. E. purpurea, the purple coneflower, is commonly called purple rudbeckia, purple echinacea, black sampson, hedge coneflower & hedgehog coneflower (Balge). Once purple coneflower is established in a landscape, it requires minimal care—just a little snipping and weeding, and some light watering in times of drought. To reduce the likelihood of pests (such as aphids, aster leaf hoppers and garden fleahoppers) E. purpurea plants should be adequately spaced, with about 12 to 15 inches between them. Watering from below, regularly removing spent leaves and keeping the area free of weeds will also reduce the likelihood of a pest infestation. 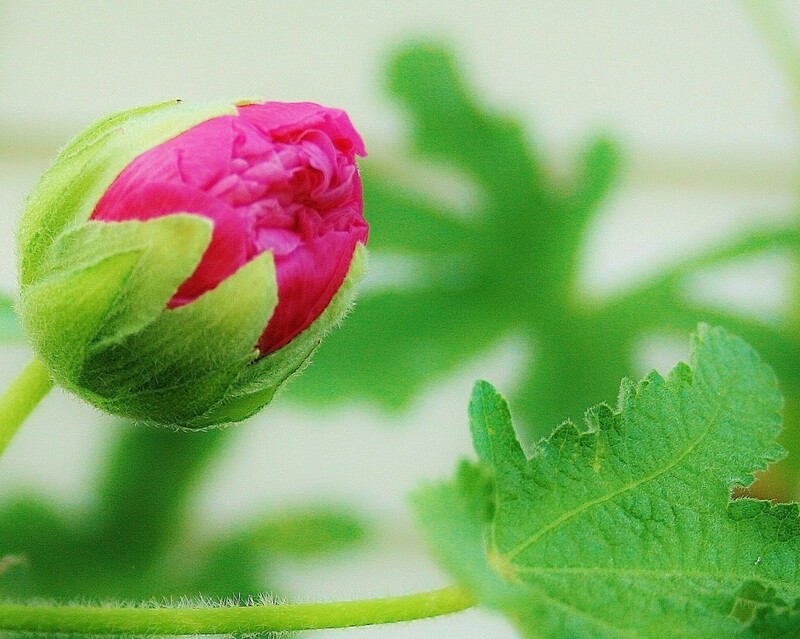 To encourage blooming, regularly harvest E. purpurea flowers. 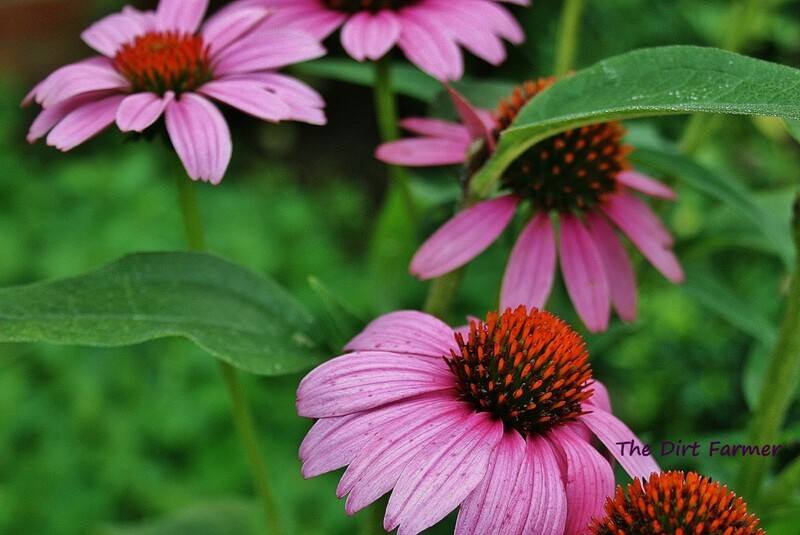 Purple coneflower plants can bloom well for several years without division. 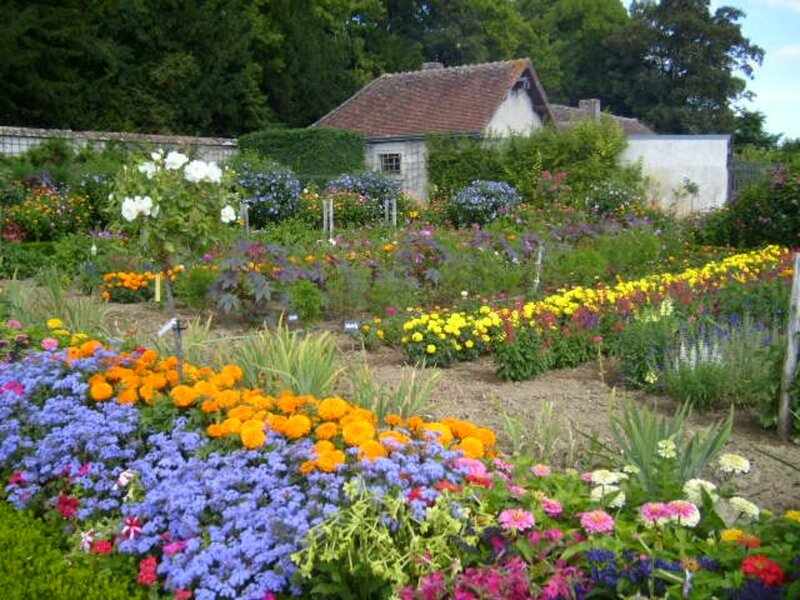 By year 4, however, they often begin to produce fewer flowers. 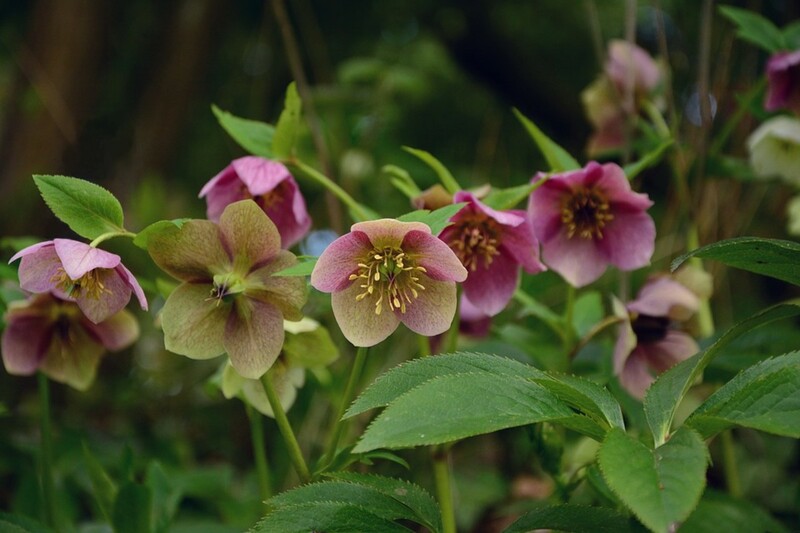 To restore the plants' vigor, split them, transplanting the divisions either in early spring or fall. Once a purple coneflower plant is established, it should be divided every 3 or 4 years to keep it vigorous. You can divide E. purpurea in either the spring or the fall as you would any herbaceous perennial. Although gardening experts recommend dividing most herbaceous perennial plants in the spring before new growth has emerged, I usually do it in the fall simply because that's when I have time to split the irises, shasta daisies, hostas, blackeyed Susans, purple coneflowers, salvia and other herbaceous perennials in our garden that are starting to look overgrown or beginning to lose their vigor (MD Master Gardener Handbook 515; "When to Divide Perennials"). When dividing purple coneflower, first I remove any remaining flowers or spent stems. Then, using a garden fork, I work the coneflower clump (crown) out of the ground and shake off as much soil as possible. Next, I pull the clump apart, separating it into two pieces, each with roots and stems attached. Sometimes, the clump is difficult to separate, and I have to cut through the roots with a trowel or sharp shovel. It doesn't hurt the plant at all. If the pieces are very large, I split them again. Then I replant one of the pieces, adding a slow-release fertilizer to the soil, and watering and mulching the area well. The rest of the clumps I transplant elsewhere or give away. If you have a greenhouse, you can even pot small clumps of purple coneflower and overwinter them indoors. Some gardeners also recommend cutting a few of the leaves in half or cutting the stems back by half before replanting (Proctor 24), and sometimes I do this, too. Finches really like purple coneflower seed. If there are lots of hungry finches where you live, consider placing small paper bags over selected flowers in order to protect them. Otherwise, the birds could get your Echinacea seed before you do! Although E. purpurea is readily available at most greenhouses, growing it from seed can be fun—and much less expensive. If you already grow more than one type of purple coneflower, you may want to buy seed rather than collect it from your garden. Purple coneflower cross pollinates, so if you grow multiple varieties, you're unlikely to get plants that are like their parent plants from the seed that you harvest (Turner 170). 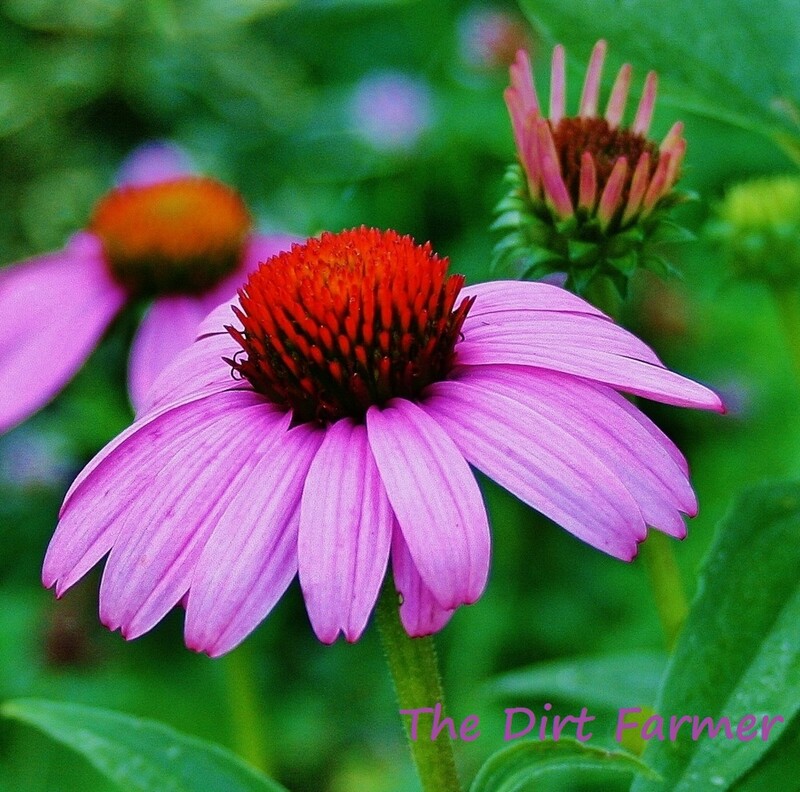 If you grow only one variety of E. purpurea, however, (or don't care about preserving a particular strain of Echinacea seed) you can begin harvesting coneflower seed in late summer and plant it either in the fall or spring. Or, you could simply allow E. purpurea to reseed itself! 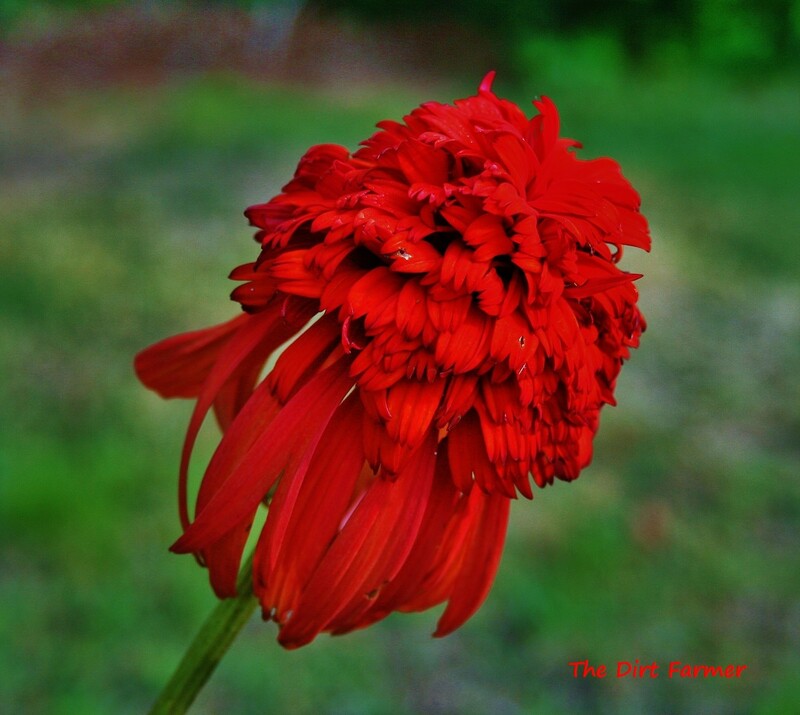 Once the Echinacea flower heads have dried and changed color, snip them off the plant and remove the stalk and any remaining leaves or petals. Then pull the seeds from the seed head with your fingers, removing additional chaff and discarding any seed that is shriveled or lighter in weight than the rest. Allow the purple coneflower seed to dry indoors at room temperature on something absorbent, such as sheets of newspaper, paper towels or paper plates, for 1 or 2 weeks before storing it. If you plan to start E. purpurea in the spring, place the dry seed in a sealable container and store it in the refrigerator until you're ready to use it. 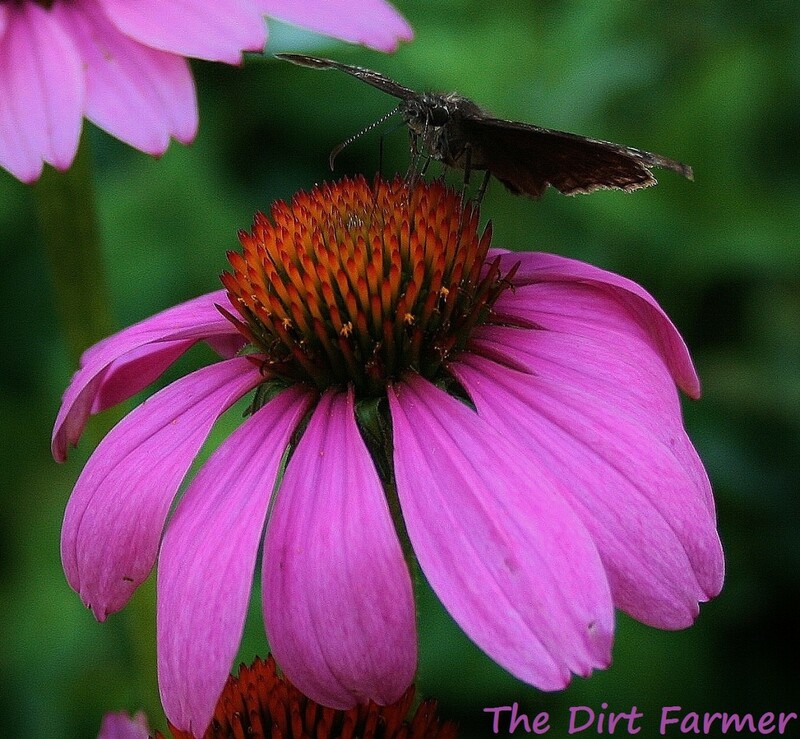 Keep in mind, however, that purple coneflower doesn't produce a high percentage of viable seed per cone. Only 25 to 50 percent will germinate, and the rate goes down the longer the seed is stored (Balge). To allow for this, collect lots of E. purpurea seed. Sowing collected seed in the fall, not long after it's been harvested, rather than waiting until spring will also improve its germination rate. 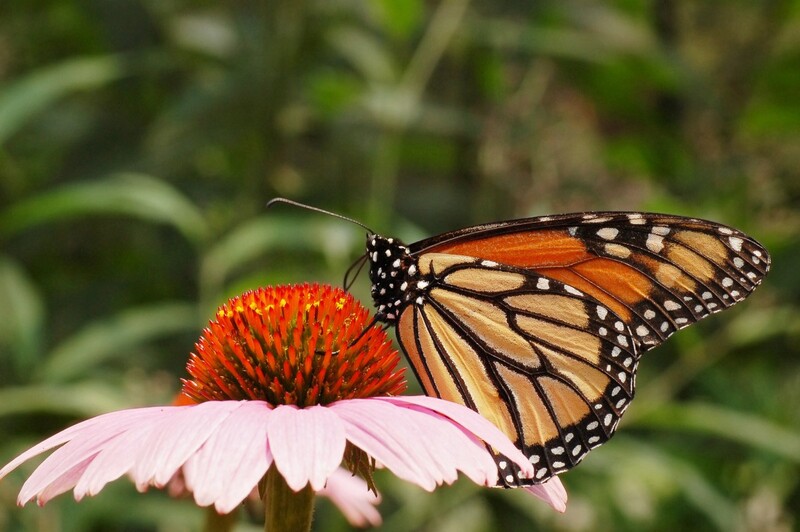 If you decide to sow purple coneflower seed in the fall or spring, plant it directly outdoors. 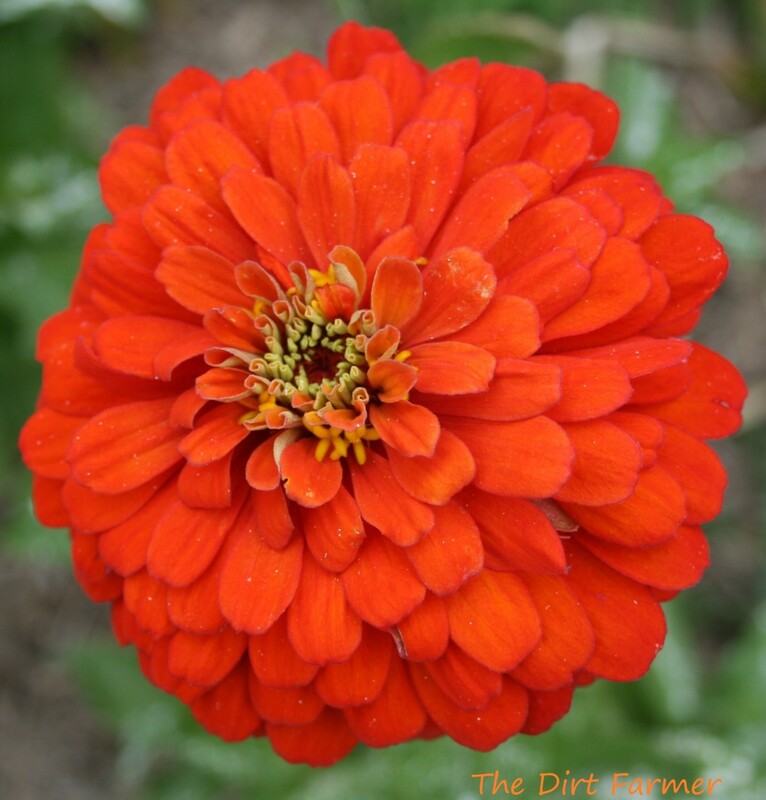 Cover the seed lightly with soil and firm it into place with your hand or the back of your trowel. Write the plant name and the date sown on a stake and place it next to the area, marking it so that you don't inadvertently plant over the seeds. Then gently water the purple coneflower seed into place using a watering can with a rosette attached. In spring, E. purpurea seedlings will emerge. If you decide to start E. purpurea seed indoors during the winter, allow yourself about 3 months to produce seedlings that are ready to transplant—2 months if you don't chill the seeds first. 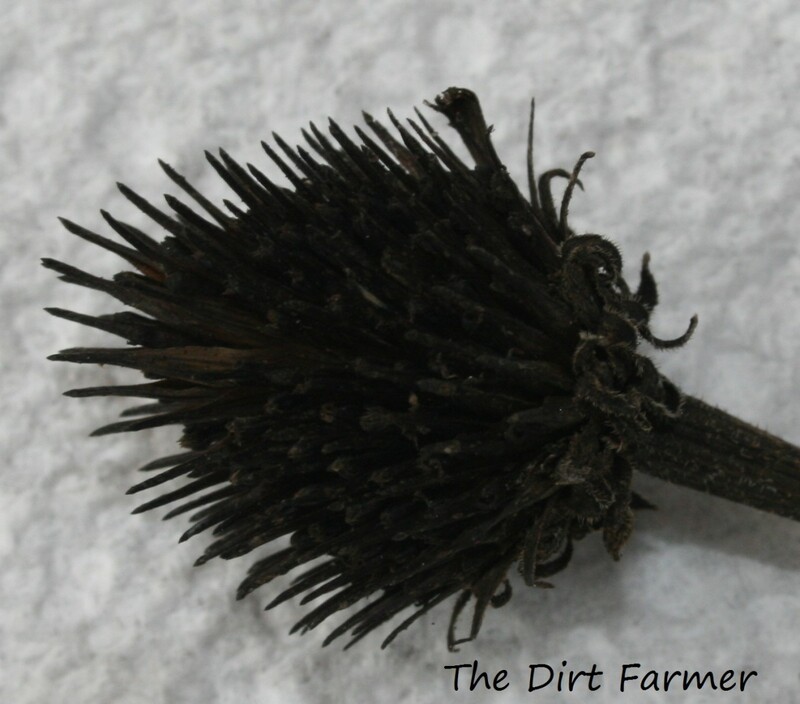 Chilling purple coneflower seed, however, is recommended as it will improve the germination rate. 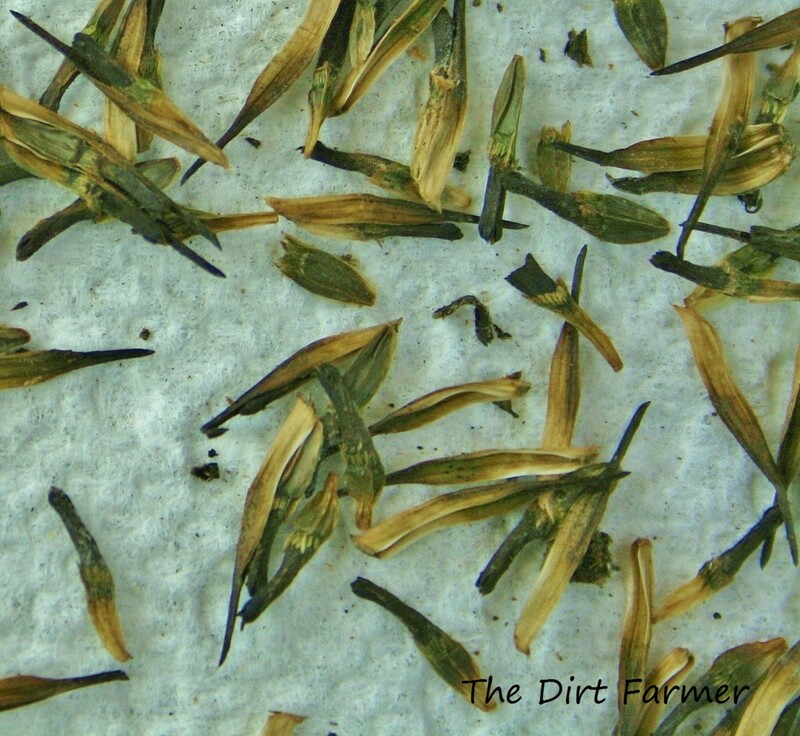 For this reason, it's probably wise to place the seed in a clean, sealable container in the refrigerator for at least 4 weeks before sowing (Balger; Turner 171), a process known as stratification. 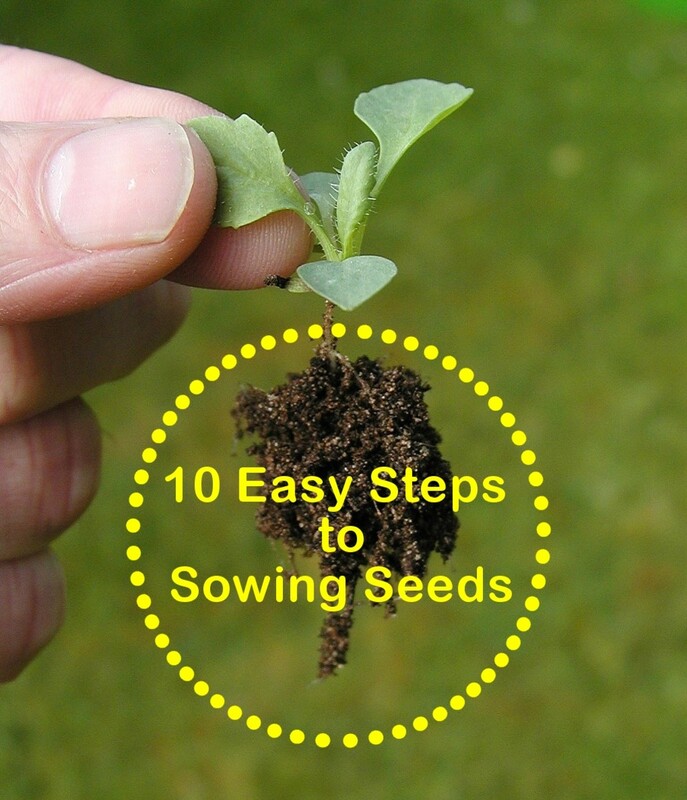 After chilling, sow the seed in growing medium suitable for seed starting, covering it lightly with moist soil. Place it in a warm room (about 70 degrees F) under grow lights. Mist the soil frequently to keep it moist until the seeds germinate. This will take anywhere from 10 to 30 days (Balger). Balge, Russell and others. "Production of Purple Coneflower as a Cut Flower." Maryland Cooperative Extension. University of Maryland. 21 August 2012. Web. The Maryland Master Gardener Handbook. University of Maryland Extension Master Gardener Program. College of Agriculture and Natural Resources. 2008. Print. Proctor, Rob. Gardening on a Shoestring. Boulder: Johnson Books, 2006. Print. Turner, Carole B. Seed Sowing and Saving. Canada: Storey Communications, 1998. Print. "When to Divide Perennials." Iowa State University Extension and Outreach. September 2006. Iowa State University Extension. 23 August 2012. Web. We planted some last year in our cottage. I hope they are fine buried in the snow now. Congrats on all your Editor's Choice. Your hubs are really great. Jill - Your gardening hubs are always so lovely and I was wondering if you wouldn't mind me giving you a shout out in a hub I am finishing up in a few days. It's about Flower Pounding on fabric. Just wanted to check before I did it. Thanks. Fantastic hub! Jampacked with great information. I love Echinacea. So much that I have been working on my own hub about them. It's more of a "why grow" rather than your "how to grow". May I link your hub for growing information? I LOVE purple coneflowers. In the fall when the seed head has dried on the stem, I carefully usher it into a paper bag or wrap it with a paper towel. Then I take the seed head to a spot in my garden where it will be happy. Next I shake the seed head to release all the little seeds over my new garden area I've prepared just for them. I do this every year with several of my coneflowers. Then the rest are left for the birds to distribute. I now have a LOT of coneflowers, which are visited by beneficial bees and butterflies! Great article with lots of useful information as always. Voted Up, Interesting, Useful and Beautiful, also Shared & Pinned! Your photos are always gorgeous and hubs so informative. I have a couple varieties in my garden and it's always a great performer. I love cornflowers and I grow them I have pictures on one of my hubs but they never last. They die no matter where I put them. I guess the cold winter kills them. Enjoyed reading your hub. When we drove through Iowa cornflowers were growing all along the highway, so pretty. This is a lovely flower. I am always looking for something that is colorful.Thank you for the detailed explanation on how to grow them. I will be looking for some of these to grow after Issac passes. We have a little storm hovering around Florida right now. I will watch your posts for more info on growing things. this is a gorgeous flower, gorgeous. I do so need some of these in my yard. Thank you for the detailed information on how to grow them. I will look into to getting some for my yard after Ivan decides what he is going to do. I do not want to plant anything new outside until this nasty little storm moves through. Wonderful hub for such a thriving flower. I have them where they shouldn't be, pull them out and plant in other places. I pass them to my mom and ex mother in law. I let the golden finches eat the seeds and I save some to give to other people. They are too tall for a front flower bed, so mind the height and the fact that you can pull them all out and it will look like you never did! I do love them when they are blooming but they are an eyesore afterwards in the front yard.